Exposure to certain chemicals such as phthalates, parabens or bisphenol A could be associated with a decrease in blood pressure during pregnancy. This is one of the main conclusions of a study led by the Barcelona Institute for Global Health (ISGlobal) and published recently in the International Journal of Hygiene and Environmental Health. Hypertensive disorders during pregnancy are one of the main causes of maternal and child mortality and morbidity. Exposure to environmental chemicals is suspected to increase the risk of high blood pressure, but few studies have addressed the effect of non-persistent chemicals—those that linger only for a brief period into the body, particularly among pregnant women. This study, which is part of the HELIX project, followed 152 pregnant women from Barcelona (Spain), Grenoble (France) and Oslo (Norway). The researchers collected three urine samples per day over one week in the second trimester and one week in the third trimester in order to measure exposure to 21 substances: 10 phthalate metabolites, seven phenols including parabens and bisphenol A (BPA), and four organophosphate pesticide metabolites. Blood pressure was measured at the end of each week. The major strength of this study lied in its repeated and prospective design and the use of multiple biospecimens per person. The results show that "a higher exposure to some phthalates, BPA and parabens were associated with a decrease in blood pressure, both systolic and diastolic, particularly in the second trimester," explains Charline Warembourg, ISGlobal researcher and first author of the study. No association was found for pesticide exposure. 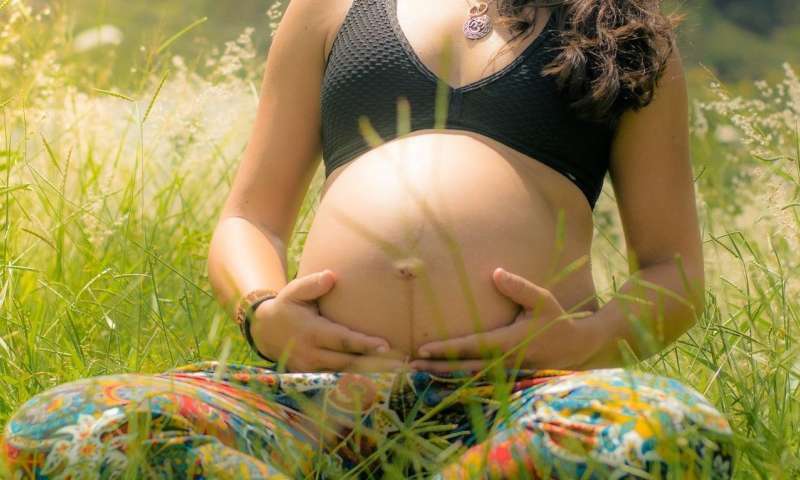 "Our findings do not support the hypothesis suggested by previous studies of a hypertensive effect of phthalates, phenols or pesticides during pregnancy," concludes Maribel Casas, ISGlobal researcher and study coordinator. "This apparent contradiction with studies in non-pregnant populations may reflect physiological changes that occur during pregnancy and modify blood pressure." Thus, non-persistent chemicals could actually enhance the decrease in blood pressure frequently observed in the first mid of the pregnancy. Another possible explanation is that "the study did not cover the late pregnancy period, which is at risk for onset of hypertensive disorders," said Warembourg. A potential mechanism that could explain how these chemicals affect blood pressure is endocrine disruption. Once the chemicals are introduced through diet, skin or air, they can imitate the action of hormones. For example, BPA has estrogenic properties and estrogens are themselves known to have protective effect on arterial stiffness.